Calcium is critical for strong bones and teeth, and the body’s most abundant mineral may also help keep you well rested and healthy. Research shows that consuming calcium-rich foods or taking a calcium supplement before bed can help you fall asleep and sleep well. Getting calcium at bedtime may also help prevent mineral deficiencies and bone loss that lead to osteoporosis. Calcium helps form bones and teeth and is essential for nerve, enzyme, heart, muscle and blood-clotting functions. Inadequate intake of the mineral can lead to early bone loss, which can result in weak bones and an increased risk of fractures in older adults. The National Institute of Health’s Office of Dietary Supplements recommends adults ages 19 to 50 consume 1,000 milligrams of calcium daily, while adults 51 and older should get 1,200 milligrams. Good sources of calcium include dairy products, green leafy vegetables, and salmon or sardines. If you are not getting enough calcium from your diet or are at risk of osteoporosis, you may need a calcium supplement. Calcium is a natural sleep aid that can help you fall asleep and have a restful sleep. The mineral contains tryptophan, an amino acid the body uses to produce melatonin, a natural hormone that helps induce and maintain sleep, the National Sleep Foundation reports. Research shows low calcium levels are associated with disturbed sleep patterns, including the lack of a deep REM sleep phase, according to Medical News Today. When levels of calcium are inadequate, you may wake up soon after falling asleep and have trouble getting back to sleep. 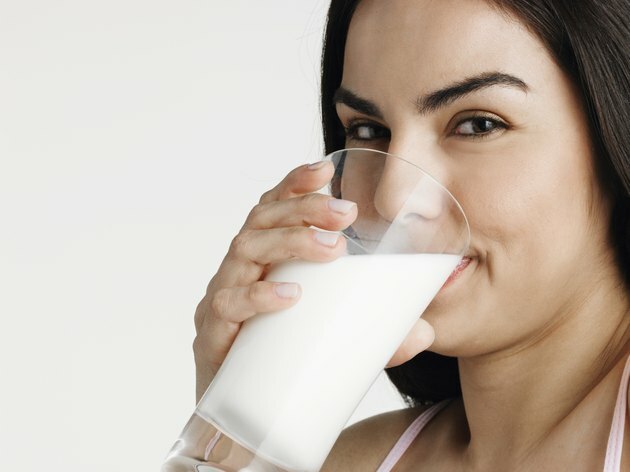 Research suggests taking calcium before bed may help reduce bone loss. A study in the June 2005 issue of the “Journal of the Medical Association of Thailand” found that postmenopausal women who took calcium supplements before bed had lower levels of bone loss compared to women who took the supplements after breakfast or dinner. While the results are promising, research is conflicting and further study is necessary to validate these findings. Taking calcium supplements before bed can help reduce the risk of a mineral deficiency. If you have low levels of zinc, magnesium or iron, taking a calcium supplement during the day may interfere with absorption of the minerals. If you take calcium supplements at night rather than with meals, the timing can help reduce any interactions. Certain calcium supplements are best absorbed with food. If you are taking a calcium carbonate supplement, take it with a meal, because stomach acid helps absorb the mineral. Calcium is best absorbed in amounts of no more than 500 milligrams. Take calcium supplements throughout the day so your body can absorb the most calcium while reducing side effects such as bloating, gas or constipation. What Are the Benefits of Bone Meal Supplements?